Skirting tax laws and knowingly hiring unauthorized workers are common practices in Texas, especially in the state's construction industry. Lawmakers and workers' rights groups are trying again to target companies that misclassify workers. 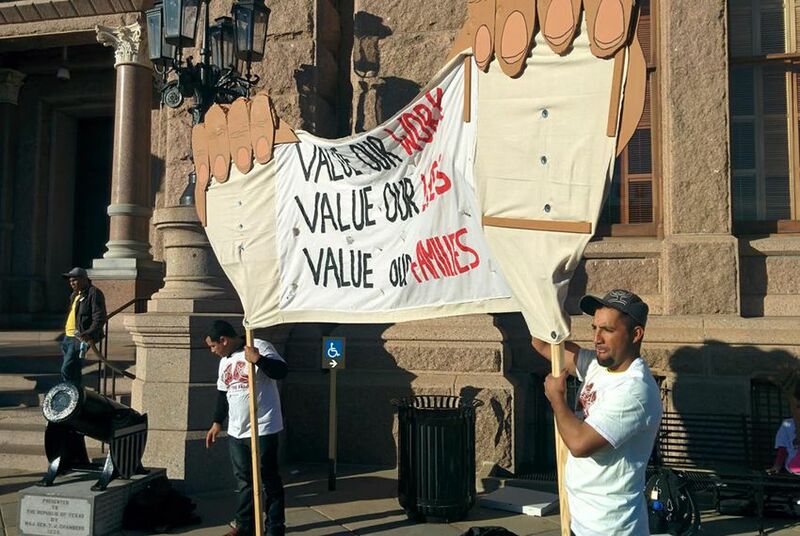 Workers’ rights groups in Texas are revamping their efforts to increase protections for low-income laborers by urging lawmakers to crack down on employers that intentionally misclassify their employees. Misclassifying workers as independent contractors — rather than employees — allows employers to avoid paying payroll taxes, overtime and workers' compensation. The practice also allows employers to skirt federal law that requires new hires to provide proof that they can work in the country legally. About 35,000 Texas workers were misclassified between 2010 and 2012, according to the Texas Workforce Commission. That includes 4,300 in the construction industry and 4,100 in the health care and social assistance industries. Those workers’ employers should have paid about $2.4 million to the state’s unemployment insurance fund, according to a report by the Legislative Budget Board. Critics of altering the laws in Texas have argued that doing so would drive up the cost of new homes because such sweeping changes would cause businesses to incur administrative costs that would be passed on to buyers. Since 2008, 27 states and the District of Columbia have passed bills cracking down on worker misclassification, according to the budget board report. Independent contractors are considered self-employed and responsible for paying their own taxes. For employees, the employer is responsible for paying the payroll taxes and deducting them from a paycheck. In 2013 the Texas Legislature passed a bill allowing the Texas Workforce Commission to fine a business $200 for each employee it deems misclassified. The law, by former state Rep. John Davis, R-Houston, only applies to businesses with government contracts. A more sweeping measure that would have applied to the construction industry, also by Davis, never made it out of the lower chamber. This session, state Rep. Senfronia Thompson, D-Houston, has filed a bill similar to Davis' construction industry proposal. House Bill 434 would fine a construction employer $100 for each worker who is initially misclassified and $1,000 for each subsequent offense. In 2013, opposition included members of the Leading Builders of America, a national trade group that represents the 20 largest homebuilders in the country. The organization did not respond to a request for comment on this year's proposals, but an attorney for the group told the House Committee on Economic and Small Business Development in 2013 about the group's concerns. State Sen. José Rodríguez, D-El Paso, is proposing changes for all industries, not just construction. Rodríguez’s bill, Senate Bill 927, would assume all workers are classified as employees unless the employer reports to the Texas Workforce Commission that they are independent contractors. His bill hasn’t been referred to a committee. Workers' rights groups pushing a crackdown on misclassification must toe a fine line because such changes could leave thousands of workers out of a job, specifically in the state's construction industry. Many workers now classified as independent contractors would not be legally allowed to work as employees because they are undocumented immigrants. While immigrant rights groups and some construction industry leaders still hope that Congress will pass immigration reform — and give many undocumented workers legal status — the chances of that seem to be fading. And a temporary measure that would let about 1.4 million undocumented Texans live and work freely is on hold. Gallardo said she hopes comprehensive immigration reform — and changes to state law — will pass. When asked about those potential unintended consequences, Anderson said that’s not what he thinks the legislation should do.